About - Todd Sheep Company Inc. The Todd family’s passion with breeding and showing purebred livestock began almost a century ago, when Hugh’s grandfather Frank Todd, along with son Tom first took their Aberdeen Angus cattle on the show circuit. Trophies, plaques and ribbons from Toronto’s Canadian National Exhibition (CNE) and Royal Agricultural Winter Fair (RAWF) and even the Chicago International Exhibition still are on display at Hugh & JoAnn’s home. Don Head Farms of Richmond Hill Ontario were also recognized Aberdeen Angus breeders and they had Southdown Sheep. In the late 1940’s Tom traded some Todd Angus heifers for Don Head Southdown ewes, and the Todd Family entered the sheep business. aboutus-72champ-300x394The quality of the Todd lambs at the sales barns drew the attention of another prominent mid-western Ontario sheep breeder, who started purchasing Todd lambs, showing and winning with them. So, Tom, along with son Hugh decided to start showing their own sheep! 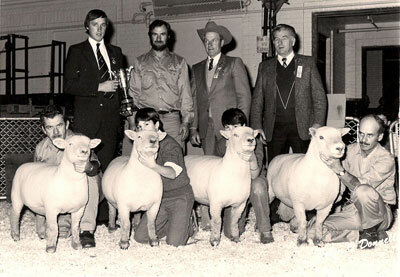 In 1972, the Todd Family won the first of what was to become a succession many Champion market lambs at the RAWF. In 1970 ‘Todd 3A’ won Champion Southdown Ram at the CNE and the RAWF. The 1970’s & 80’s saw expansion and development in the Todd flock with the introduction of a second breed, Hampshires into the business, and the importation of various New Zealand bloodlines in 1980. This would significantly improve the size and growth in their Southdowns, leading the curve in the quality in Canadian Southdowns. 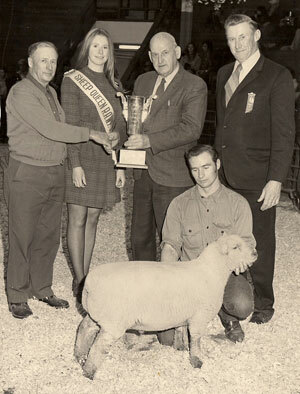 Again the results were impressive, with Hugh & JoAnn winning Supreme Flock at the RAWF in 1984. From 1989-1994, Hugh pulled off a remarkable accomplishment , a 6 year record which still stands unmatched – 4 consecutive Champion Market Lambs at the RAWF, from 1989 to 1992, in 1993 Reserve Champion and Champion again in 1994 — all with Southdown or Southdown x Hampshire lambs. In the 1990’s a series of top US rams were used to further build on the New Zealand bloodlines including Cole, Howard, Mapolyne and Weiringa. Todd bloodlines continued to top the showrings and purebred sales, selling across Canada and into the US. 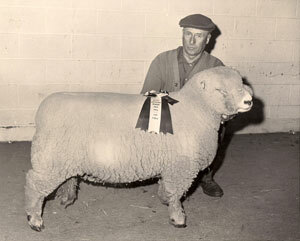 The Hampshire flock also began to make waves in the showring during the 1990’s; capped off by winning Supreme Champion Ram at the Royal in 1996, the year Hugh & JoAnn’s son Keith graduated from Ridgetown College. Keith branched out the Todd Family’s sheep business further with the introduction of Suffolks and Polled Dorsets, while continuing to work out selling feed and doing nutrition consultations. 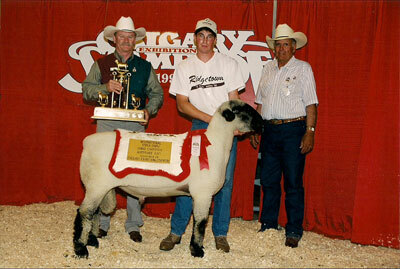 In 1998, Keith showed at the Calgary Stampede and had Supreme Ram with a Hamp Ram “Todd H&J 91G’. Purchased by Destiny Ridge Farm and renamed “ShowGun” by his new owners, he became a strong influence in the breed, and his name can still be found in a multitude of Hampshire pedigrees. At the turn of the century the sheep industry was booming, prices were at record highs and expansion of the sheep industry was in full swing –until the Alberta BSE crisis in 2003 caused red meat market to plummet, forcing many to leave the industry. Just prior to the Canadian/USA border closure, ‘MacCarthy 2011’ was purchased at the Midwest Stud Ram Sale in Missouri. Like ‘ShowGun’ before him, ‘the MacCarthy Ram’, as hewas called, has become one of the most influential Hamp rams of the breed in Canada, leaving his mark not only in the show ring and on his productive daughters. A well-known sheep family used MacCarthy daughters as their starter flock, and said they were the best sheep they had ever bought—great mothers and extremely productive. In 2008 Todd’s had another Supreme Champion Ram at the RAWF with a grandson of MacCarthy Ram, Todd H&J 43U—as a ram lamb. 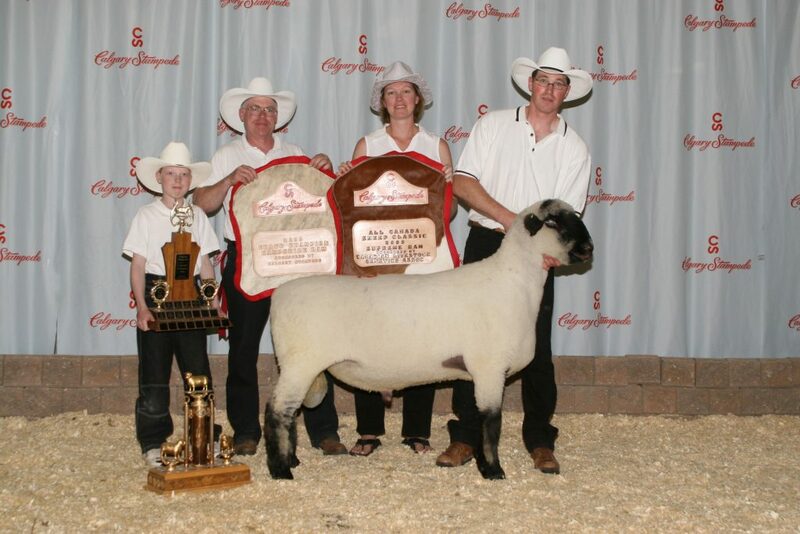 He became Supreme Ram again in 2009, at the Calgary Stampede, 43U (aboutus-43u.jpg) topping the Canadian Classic Sale. In 2005, Hugh, JoAnn and Keith amalgamated their operations to form the Todd Sheep Company Inc, and Valerie, Keith’s new wife joined the family. 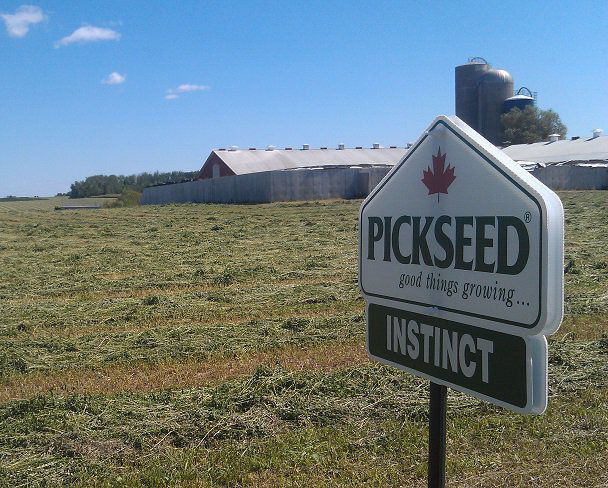 The Dorsets were sold, and a dairy cow farm was purchased and renovated, beginning a 5 year venture into the dairy sheep business, milking Friesian and Friesian Rideau crosses. A back injury for Keith forced the need to liquidate the dairy flock in 2010, making room for high-health, high-production Rideau Arcotts and an elite selection of Ile de France ewes, a relatively new breed to North America. Ile de France are known for excellent muscling and maternal characteristics—a combination not usually found in one breed. Over the years of changing styles of sheep and production techniques, quality livestock has always had its place in Canadian agriculture. While individual champions within a flock are great to have, a long standing record of producing genetically dependable animals is what guides production systems in the right direction. For almost a century, the reliability of the animals coming from the Todd family and the consistent quality of the genetics is proven and undeniable. We depend on our sheep to produce for us. We always have, and will continue to produce sheep with traits that will translate into economic gains for sheep farmers, because we are farmers and have been — for generations. The Todd Sheep Company Inc.